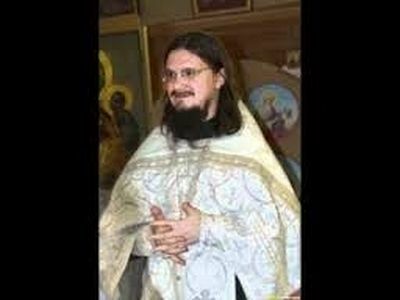 Can One Consider the Death of Father Daniel Sysoev to be a Martyrdom? Death is the last event in a person’s earthly life. For a missionary, death is the last homily, the last message preached, the last witness for Christ, Whom the missionary loved with complete readiness to sacrifice his or her life for the sake of the triumph of the Faith. Father Daniel Sysoev had prepared himself for this sacrifice long before. Even in his younger years when studying at the Moscow Theological Seminary where this writer taught Fundamental Theology, Father Daniel was pierced through with the fiery conviction that only Orthodoxy contained the fullness of saving truth. Possessed of great talents, as a seminarian he already knew the church canons, and passionately contested with students and instructors when they allowed themselves the slightest compromise. To people who were indifferent to the spreading and deepening of the faith, his aversion to compromise seemed strange; and some of them fell into judgment and condemnation—but his death as a priest in the church which he himself had built, gave proof of his earnestness, his zeal, his single-minded commitment to Jesus Christ and His Church. Father Daniel Sysoev carried out his missionary activity among Moslems. His Evangelical preaching was very successful: He converted and baptized many people; he received death-threats in response. His answer to such threats was to preach Christ with still greater zeal. Therefore his death is a Christian sacrifice for the sake of the great cause to which he felt called by Jesus Christ. Such a death is an open and manifest victory, because “warriors for Christ are not killed, but crowned” (St Cyprian of Carthage, hieromartyr. Epistle 66). The early Christians referred to the day of death of their brothers and sisters in the faith as their birthday—birth into a new life. With the coming to earth of the Saviour, mankind’s relationship with death was changed forever. “If we believe in Christ, and if through faith in His word and promises we shall never die, then we ought with joyful daring to go to Christ, by Whom and with Whom we shall live and reign forever. It is through temporal death that we cross over to immortality; and eternal life can begin for us only after our departure from here. And this is not really a departure but only a crossing over or resettlement into eternity after our temporal sojourn on earth. Who would not hasten to cross over to that which is better? Who would not desire to be changed and transfigured according to the image of Christ and the sooner to partake of heavenly glory?” (St Cyprian of Carthage, hieromartyr. Book on Mortality). To him (or her) who dedicates himself to the service of Christ are given various means to bring people to the Truth: preaching by word, and preaching by one’s life as a living example of self-sacrificing service. These earthly labors for Father Daniel have ended. There remains the brightest and most powerful preaching: the preaching of death. “From henceforth, blessed are the dead who die in the Lord: Yea, saith the Spirit, they shall rest from their labours; for their works do follow them” (Revelation 14:13). Fr. Daniel Sysoev was short dead in his church in Moscow on November 19th, 2009. 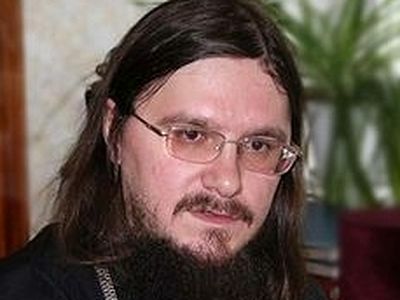 The reason for the murder of the priest Daniel Sysoev was the success of his mission among the Muslims, says his friend the famous missionary Father Oleg Stenyaev, according to the news agency Interfax-Religion. 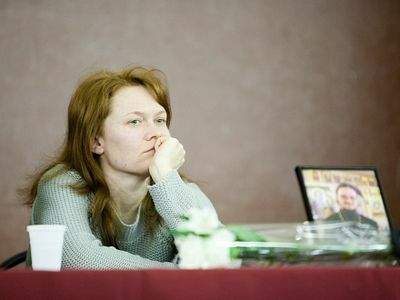 Julia Sysoev: "One Can Never Get Too Much Help"
Catherine Lyulchak, Julia Sysoeva Julia Sysoev: "One Can Never Get Too Much Help"
It's probably as it is with all the newly widowed: most difficult is learning to live again without him. Life is divided into “before” and “after”—into different eras. But it is necessary to begin a new life, not to pull the load of continuous, depressing memories and resentments. This period of transition between one state and another was the most difficult. But from the first day I saw that the Lord intervenes in all situations, arranging the necessary route. The Lord leads me. This gives us strength. Could you please forward the following leter of mine to Fr. Job ? Rev. Fr. 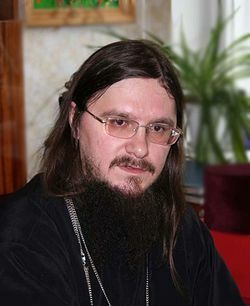 Hieromonk Job Gumerov. Secondly, I would like to ask for your permission, in order to publish the German translation of the above mentioned text, in the Orthodox blog vatopaidi.wordpress.com. This blog has been created from friends of the Holy Great Monastery of Vatopaidi, Mount Athos, Greece. It publishes contributions in twelve languages (Arabic, Greek, English, German, Russian, Romanian, e.t.c.). I am responsible for the texts in German language, and I am cooperating for the publications in English and Greek. Looking forward hearing for you.